Cliff Terminal Posts TP/60 - Series is developed for use in high current applications - up to 60A. Two stud length options are available. Specified as TP/60 and TP/60S with Nickel plating. Each of the two standard models can be supplied as gold plated options. The model numbers in this case are TP/60G and TP/60SG. These terminals are designed to be touchproof and conform to the general requirments of UL 813 and EN60065. The castellated knob is a trade mark of CLIFF UK. Flammability Min UL94HB UL approval is pending. 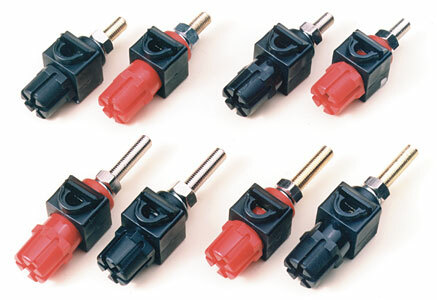 Accessories - Terminals are supplied with 1 plain washer, 1 spring (s/s) washer and 1 nut. Supplied unassembled.